Almost a full week before Google officially announced the new white bar, we predicted Google would launch the new white bar over the next few days. Okay, so I was a bit eager, and it took 3 additional days to become official, but Google finally admitted it. Regardless of your routine, getting around Google should be seamless, and once you're inside an app, you don't want any distractions. So we're introducing an updated Google bar that streamlines your experience across products and devices. What is interesting is that with this launch, Google is introducing a new flatter logo and icon set. Right around the iOS 7 release, which whole design philosophy is around flatter logos and designs. When will you see it? Well, many do already but Google is phasing out this launch over the "next few weeks." There is a help document just on the new white bar, if you need help. This simpler design lets you focus on your in product experience but switch to other Google products when you need to. How do I switch to another Google product? 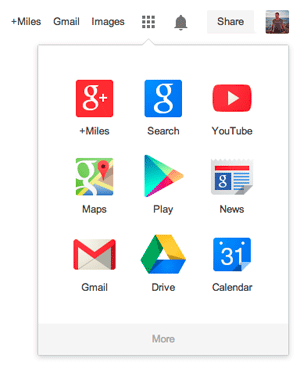 To open a new product, click on the Apps launcher icon and you’ll see a list of other Google applications. Forum discussion at Google Web Search Help & WebmasterWorld.